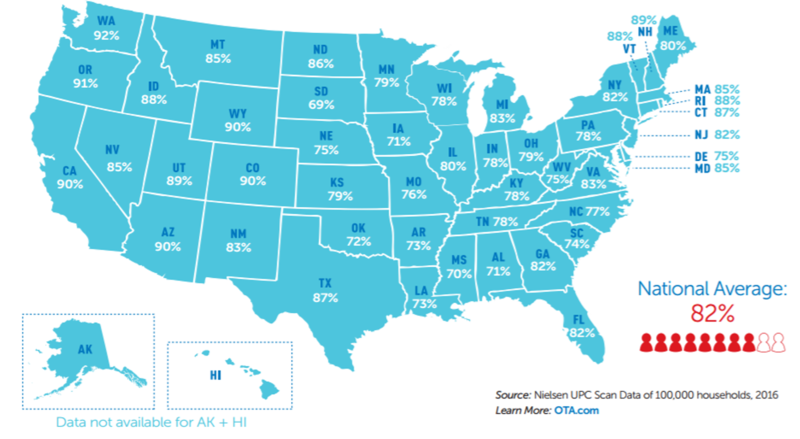 If you’re looking for the latest data on the organic industry, you’ve come to the right place! OTA is the premier source of information about organic. Whether you're looking for the size of the organic market, organic industry trends or insights into the organic consumer, OTA is here to help. 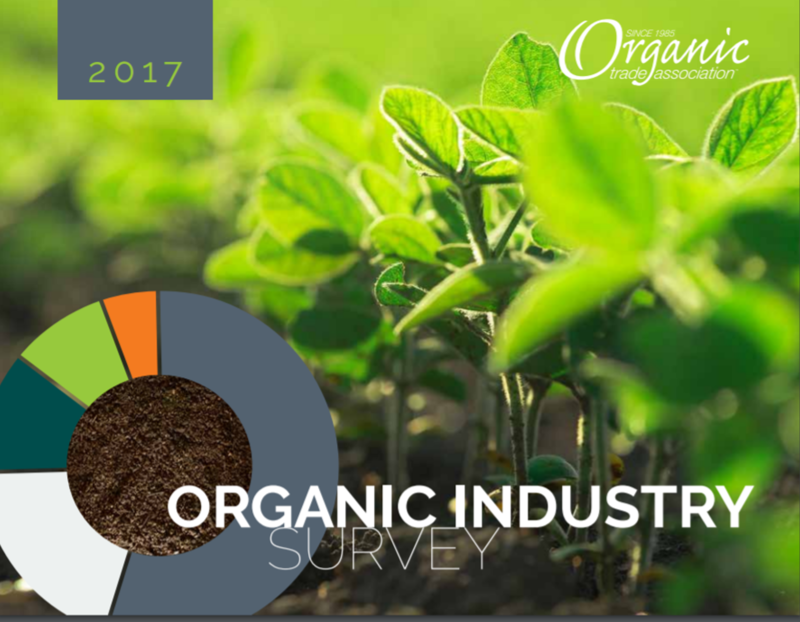 Organic Trade Association's 2018 Industry Survey is now available. Check out our press release unvieling some of the latest data and check back soon for more details. 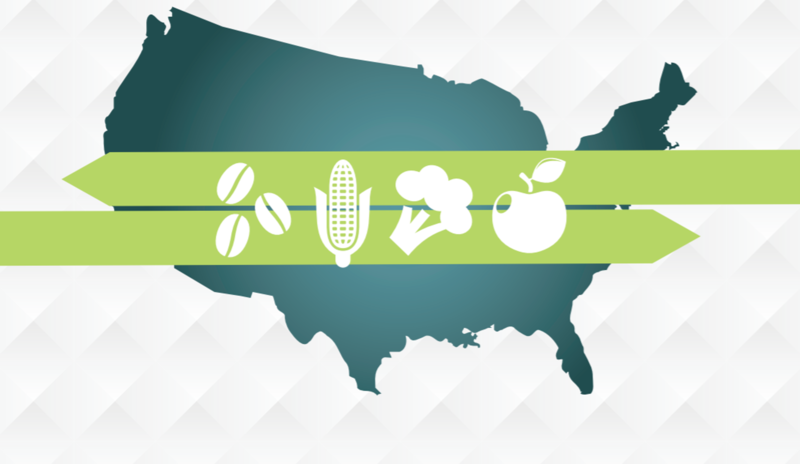 Each year, OTA publishes two flagship research products—the Organic Industry Survey and the U.S. Families’ Organic Attitudes and Beliefs Study, to inform the business, media, government and other communities about the organic trade. 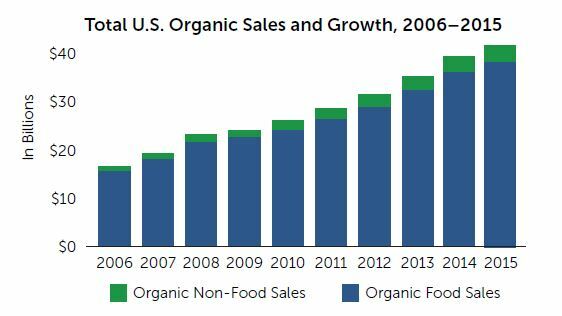 Organic sales in the U.S. totaled around $49.4 billion in 2017, reflecting new sales of almost $3.5 billion from the previous year. Organic food now accounts for more than five percent of total food sales in the U.S. Organic food sales increased by 6.4 percent from last year, blowing past the 1.1 percent growth rate in the overall food market. Sales of organic non-food products were up 7.4% in 2017. 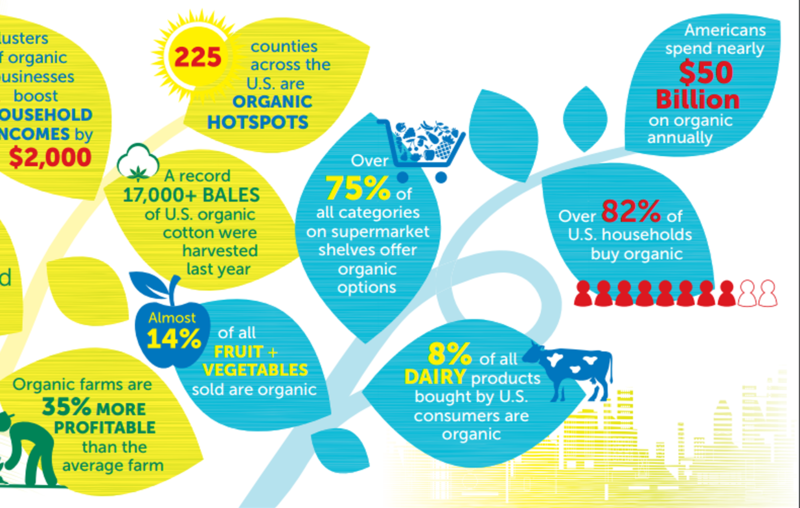 Organic is the fastest growing sector of the U.S. food industry. Organic food sales increase by double digits annually, far outstripping the growth rate for the overall food market. Now, an unprecedented and conclusive study links economic health to organic agriculture. This research identifies 225 counties in the United States in organic hotspots — counties with high levels of organic agricultural activity that have neighboring counties with high organic activity — and then looks at how these organic hotspots impact key county-level economic indicators. Organic Hotspots boost household incomes and reduce poverty levels — and at greater rates than general agriculture activity, and even more than major anti-poverty programs. Being an Organic Hotspot increases median household income by over $2,000 and lowers a county’s poverty rate by as much as 1.35 percentage points. OTA’s survey uncovers that America’s 75 million Millennials are now devouring organic, and they’re making sure their families are too. Parents in the 18- to 34-year-old age range are now the biggest group of organic buyers in America. The full study, available at a deep discount to OTA members, provides insight about organic consumers’ demographics, purchase motivation, labeling comprehension, shopping patterns, and more. Acres planted to organic cotton decreased by eight percent, from 16,050 acres in 2011 to 14,787 in 2012. However acres harvested increased to 9,842 in 2012—a 60 percent gain over 2011. 8,867 bales were produced in 2012, representing an increase of approximately 22 percent over the prior year. Commercial availability of organic seed is among the major hurdles for organic cotton producers. However, promising research is being conducted by a team at Texas A&M AgriLife Research in Lubbock, TX on improving organic and non-GM cottonseed, including fiber quality and yields, as well as increased tolerance to drought, pests and weeds. This report updates OTA-Penn State report “Preliminary Analysis of USDA’s Organic Trade Data: 2011 to 2014” from April 2015. We analyze data from USDA's Global Agricultural Trade System (GATS) spanning 2011 through 2016 for the values, quantities and prices of organic exports and imports. Product-by-product reports on the top five products of organic exports and imports include information on non-organic product counterparts. This report also includes a comprehensive overview of organic equivalency arrangements in the world and their impacts on organic trade. Projected growth rates for export products are modest in comparison with the products of organic imports, and the market share of organic imports is higher than for organic exports. Finding that organic soybeans and corn imports exhibit strong growth provides further evidence of the needs for transition of domestic acres to organic production of these commodity crops.